Lyle Ashton Harris, Untitled (Back #17 Mystery), 1998, unique Polaroid print, 20 x 24”. Lyle Ashton Harris’s “Self/Portrait” presents a selection of twenty-two images from the “Chocolate Polaroids” series shot between 1998 and 2008, juxtaposing images of the artist with those who surround and inspire him—ranging from Al Sharpton to Tony Kushner to “Mystery,” a man the artist met at a gay club. Closely cropped and hung at eye level, the portraits command the viewer’s gaze. Although all are sepia-toned and positioned identically, the subjects reveal their singularity through a curved lip, furrowed brow, or their accessories; Shirin Neshat, for instance, appears in Untitled (Face #176 Shirin), 2006, adorned with a silver necklace and dramatic eyeliner. When Harris turns the camera on other artists, such as Cindy Sherman—who in Untitled (Face #92 Cindy), 1998, appears more vulnerable than in her own work—and on himself, in the self-portraits from 2000–2008—the photographs reveal the artist’s evolving personal style and increasing comfort with the camera. 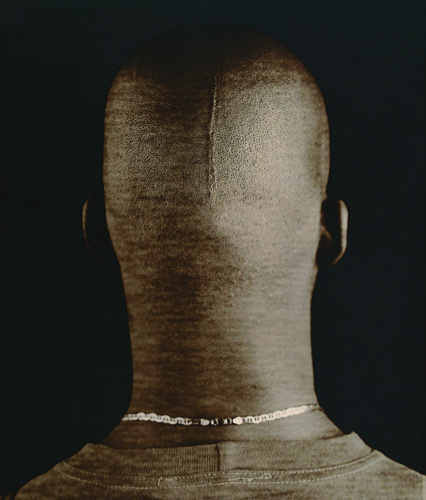 Harris’s choice to include the backs of his sitters’ heads makes for startling revelations, such as the exquisite scar that runs down the head of Mystery in Untitled (Back #17 Mystery), 1998. However, Thomas J. Lax, who organized this show for the museum, deliberately interrupts the expected diptych pairing of front and back by instead placing Cindy Sherman’s, Robert Storr’s, and Mystery’s frontal portraits on the wall opposite the back of their heads, allowing the portraits to alternately interpellate and repudiate the viewer. In exploring the intersection of race, gender, and self-presentation through portraiture, Harris’s project echoes Lorna Simpson’s Outline, 1990, which isolates the back and hair of her female African-American sitter, and Glenn Ligon’s Self-Portrait, 1996, consisting of silk-screened images of the back of the artist’s head. All invoke the racially charged relationship between the portrait and the mug shot, and the notion that bodies can be “read” and categorized accordingly.